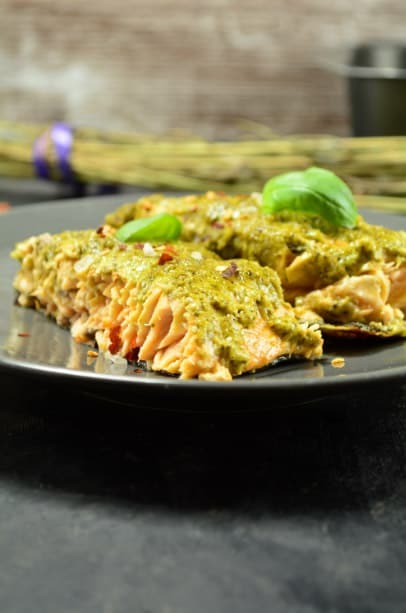 A gentle flavour of tender salmon fillets perfectly complements famous Italian green pesto. When you add some dried porcini mushrooms, lemon juice, and spices, you get a wonderfully light and delicious addition to this fish classic. Make sure to find high-quality, Atlantic salmon fillets to get the most out of this meal, and you’re good to go! Rise the salmon fillet under cold running water and pat dry with a kitchen paper. Season with lemon juice, pink Himalayan salt, porcini mushrooms, and garlic powder. Cover and refrigerate for 20 minutes. Remove the salmon from the refrigerator and drain. Spread basil pesto over the fillet and wrap with parchment paper.